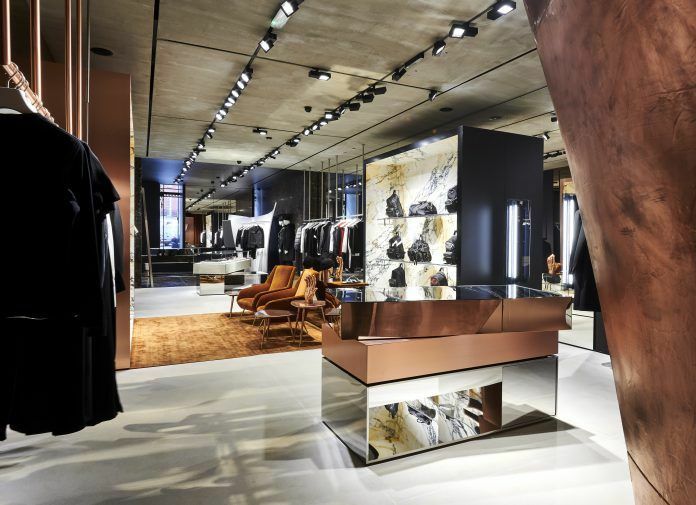 Neil Barrett has opened its first standalone shop in the UK with launch of a new flagship in Mayfair, London. Situated 41 Conduit Street, the 2152 sq ft store houses the brand’s men’s and women’s ready-to-wear collections, alongside the BlackBarrett fitness line, children’s wear and accessories and footwear range. The store concept is divided into three areas, each one with different textural materials and distinctive colours and featuring mirroring or reflective surfaces alongside Zaha Hadid furniture. In the UK, Neil Barrett also trades online and via a concession at Harrods. Meanwhile, it already has a slew of standalone stores across the globe, namely in Italy, China and Japan.